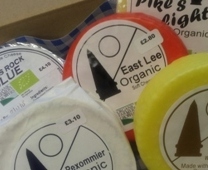 Established in 2008, the Pextenement Cheese Company aims to produce high quality organic artisan cheeses solely using our own organic milk produced at Pextenement Farm. All our cheeses can be bought online from our Cheese page. Pronounced [awr-gan-ik] - Raised or conducted without the use of drugs, hormones, or synthetic chemicals. Simple healthful, and close to nature. We only use our own certified organic milk produced here at Pextenement Farm. Our cheeses are certified Organic with Organic Farmers and Growers. When all is said and done, cheese is simply a way to preserve milk for later use, and that is why it was originally made. This need for preservation has given way nowadays to what can only be described as an art form. Of all dairy foods, perhaps none provides so much fascination as cheese. The sheer number of cheeses is enormous. The potential for new ones is almost as vast - unique varieties are constantly being developed around the world, and more importantly, are now being developed here in Todmorden at Pextenement Cheese. Copyright © MMXV Pextenement Cheese Company Ltd | Website Created and Maintained by Pextenement Cheese Company Ltd | All Rights Reserved.